“Wherever Lee goes, you will go also”. Commanding Union General U.S. Grant to Union General Meade commanding the Union Army of the Potomac. Attack: Union General Grant is continuing his “Overland Campaign” and continually attacking Lee. Grant moves south on his left flank around Lees’ right flank pushing ever closer to Richmond. The recent engagements at “The Wilderness” and “Spotsylvania” have cost both sides excessive losses. 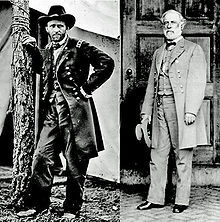 Lee cannot resupply as quickly as Grant and it is matter of attrition and time. Union cavalry under General Philip Sheridan arrives at Cold Harbor first..they are only 10 miles from Richmond. Grant orders Sheridan to hold until reinforced. 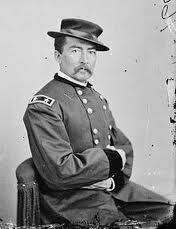 Union General Philip Sheridan and his cavalry have reached a critical crossroads at Cold Harbor, Va. on May 31. They are fortunate to have new “Spencer” repeating carbines. This is the push for Richmond and Petersburg, and the beginning of the needless Union assaults made during the Battle of Cold Harbor. They will hold back CSA attacks until June 1st when they are both reinforced. Now the carnage begins as Union divisions crash into well defended CSA with some early success. Later on June 3rd Union assaults were unsuccessful with tremendous casualties for the Federal attackers. Years later when Samuel Clemens ( Mark Twain ) was editing Grant’s memoirs when Grant had throat cancer and was in “the Adirondacks” N.Y. recuperating but dying, Grant commented to Clemens that the only attack he regretted, was the secondary assaults at Cold Harbor, Va. The Union attacks cease but Lee will live under “Coehorn Mortar” fire while a trench warfare continues for eight days with thousands of Union wounded and dead lying between the lines for days while the armies negogiate a truce, not agreed upon until June 7 when a 2 hour truce is gained to assist the Union wounded. The trench warfare continues as snipers and hand to hand combat become common. On June 12, Grant will resume his night marches around Lee’s right flank moving south as before. Even with the heavy losses, the Union army soldiers are proud and eager as they march south again to a certain elusive victory and end to the war. Many leave behind family and friends killed at this bloody encounter at the Battle of Cold Harbor. .. from the dash to Cold Harbor crossroads by both armies and won by the CSA. Follow the Union Army under Grant as he throws his best divisions against an impregenable defense set up by Lee. Attacks that Grant will later regret, but will wear down the Confederates in a war of attrition.